Our story starts in 2000, when Pierre-Noël Luiggi, struggled to find a quality part to replace the broken mirror on his car. Applying his passion for computers and car repair to the service of the DIYer, he decides to team up with a fellow MBA, Véronique Campbell, to launch Oscaro.com. Their mission was to make information and products available to anyone wanting to repair and maintain their cars. Following 3 years of negotiations with suppliers, and the development of a truly innovative user-experience, Oscaro’s first international e-commerce platform starts operations in 2003. Now car owners can buy OE and OE quality parts online, from the best manufacturers in the world, at a fraction of the price offered by automotive dealers. 10 years later, Oscaro is in the middle of significant growth. From a successful local start-up, Oscaro is now a multinational group with operations in France, Spain, United States, Belgium and Portugal. More than 16 million vehicles have been maintained or repaired with the help of Oscaro, and its team of 800 car enthusiasts. Since its early beginnings, the Oscaro Group has continuously finetuned its core tool: its unique catalog of quality automotive parts. With more than 1 million products, Oscaro has the breadth and depth to offer the right part for your vehicle, and your preferences. Enabling tomorrow’s car maintenance and repair, promoting repair communities, EV and autonomous vehicles, renewable energies, automotive data and more. These are the emerging challenges of our industry. That’s where we want to meet you and your needs. Pierre-Noël Luiggi, gets the idea to create the worldwide leader of e-commerce for quality automotive parts. Pierre-Noël Luiggi and Véronique Campbell start Oscaro: birth to the right to repair movement. Beta site Oscaro.com. Thousands of users join. Start of Oscaro Recambios in Spain. First foray in international. Oscaro catalog offers 500,000 automotive parts online for all brands and vehicles. The Oscaro Group open its technology lab in the USA to prepare for the future of e-commerce. Oscaro opens in USA, headquartered in San Jose, California – the heart of the Silicon Valley. Oscaro partners with Boa Concept, a French start-up and obtains « Supply Chain » Award, following the implementation of its revolutionary assembly line. Creation of Team Oscaro: identify future champions and help them achieve their dreams to the top. This is the philosophy of Oscaro with its Team as well. Oscaro is a community of DIY enthusiasts who get together and share online about projects, information, knowledge, and advice. Our goal? We encourage each car owner to open their trunk and find the information they need about their vehicles to maintain and repair them. This community spirit is what motivates the teams at Oscaro. Represented by 26 nationalities, we are full of enthusiasm, and eager to learn, train and participate in the ongoing evolution of the automotive industry. With the best catalog on the market, a website able to manage millions of visitors each month, a logistics always evolving, Oscaro takes on new challenges daily. 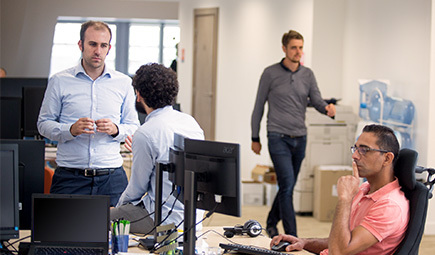 Tackling these challenges is possible thanks to a very diverse and skilled IT team: web development, logistics, data science and analytics, machine learning and more. Customer satisfaction is not a buzz word, it’s the most important job that we do. The foundation of Oscaro is to foster a community of help – a repair movement – which fully relies on trust established and sustained with its members. Oscaro ambassadors include over 180 mechanics, experts at your service in our call centers. Every day, Oscaro processes and ships tens of thousands of parts. The logistical excellence behind this feat establishes us as the largest pure player in the industry. Our warehouses are optimized to sustain our growth while taking safe care of the working conditions of our employees. At Oscaro, we answer to the specific needs of each car owner, and fight for their right to repair. Our marketing teams are focusing on developing their own know-how, while educating our customers about the many how-to’s specific to our industry. At Oscaro, we believe in open source. We have developed and defend an open and team-oriented model of creativity; to enable, identify and nurture innovative ideas, wherever they come from. Companies, citizens, and startups, from all over the world are welcome. This thirst for knowledge and for innovation drives us to deliver a superior user experience. As part of its community efforts, Oscaro focuses its efforts on mentoring young start-ups through joint projects developed together. As with our own R&D, numerous recognitions and awards have recognized the success of this form of outreach.